Hello everyone, i want to share with you my experience in the last month of dealing with music "experts" and "promoters"
As an aspiring artist that's looking for the right opportunity for promotion and marketing i used the internet recently to check out the scene through self proclaimed "experts"
I stumbled on a few websites that promote your music and get you "likes" depending on the amount you pay, and its understandable that some people like this method of promotion. I really wasn't looking for fame or for an "instant contract" all i wanted is to be heard by a professional and get some feedback. I saw a post on music xray by SoundHype / Five Hype at http://www.soundhype.com / http://fivehype.com which from their about us page is all about discovering new artists, booking shows and knowing the right people http://soundhype.com/about/ which is exactly what i want. their post said to submit your music to be reviewed by professionals with the possibility of it being featured. SoundHype charged me $20 to listen to my track. my track was selected by SoundHype within 24 hours of submission, and that's when they started asking for more money to "promote" my track, $500 before they would even tell me what are the details of what they do. the details of what happened are in the copy/paste below, i want to make sure that no one else fell for what these guys do and how they bait you with dreams and hope and sounding professional and once they know you can't be milked their tone changes to the extreme even threatening to ruin my name with all the labels and everyone in the business by abusing his interns to slander a name because i mentioned i would tell people about my experience with them. Hi my name is Andrew, I work for SoundHype. We have selected your music onmusicxray.com and would like to get a little more information about your track. 6. Professional Organization- a) BMI b) ASCAP or other. Thank you for selecting my song Deltitnu. I am very happy and excited! 3) Happy, Excited or Make you dance. 5) I produced this song from scratch. I have my midi keyboard, my MacBook Pro and my headphones. I use vst synths and play everything on the keyboard. I use Cubase for my DAW. 7) All rights of the song belongs to me. I hope I answered your questions. Please let me know what is the next step from here for which I am very excited. I'm just following up with you. It's been a week since I responded to your email. 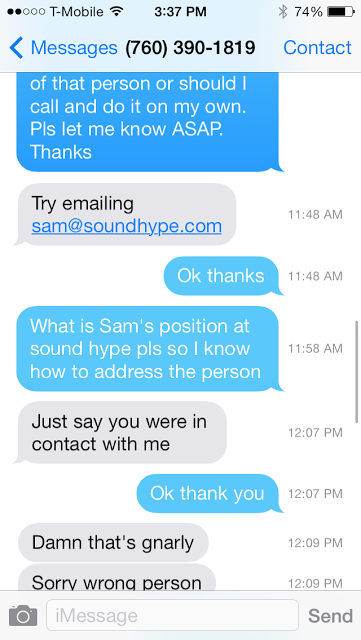 I just want to know what is the next step with SoundHype and how long does your company usually takes to be in full contact with me. 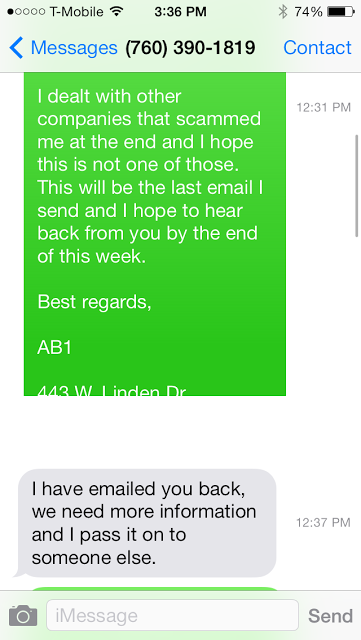 This is AB1, it's been almost 2 weeks since the last email I received from you. And I am now wondering if you are going to be in contact with me! 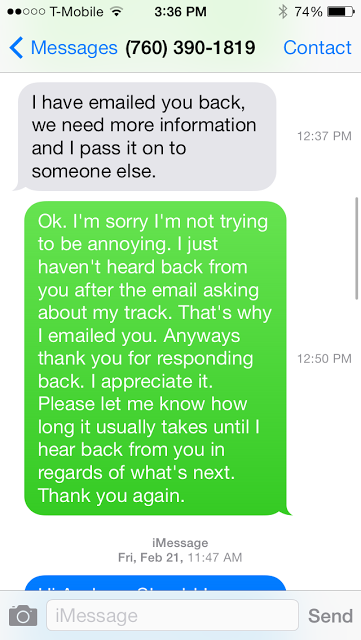 I called you, left you a message and emailed you last week and I still didn't hear back from you. 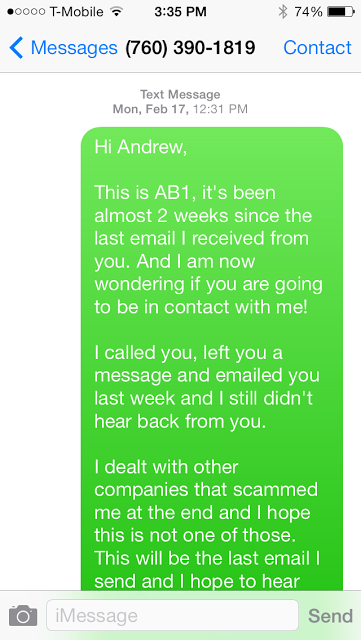 I dealt with other companies that scammed me at the end and I hope this is not one of those. This will be the last email I send and I hope to hear back from you by the end of this week. 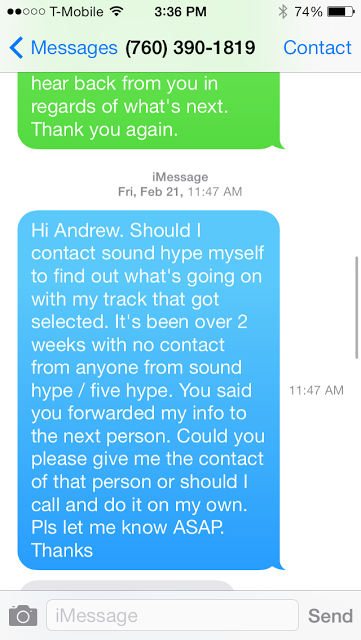 I was given your email by Andrew Provost from Sound Hype. My Track got selected by your company, and its been over 2 weeks with no contact about what is the next step. Please contact me as soon as possible to let me know what is the next step from here. My Track got selected over 3 weeks ago by your company on music x-Ray. Andrew emailed me about my song sheet and he said that you should go over some marketing plans with me. Here is everything we offer. We do payment plans / monthly retainers / and include instrumentals for you to record to and original hooks for you to release. A & R Panel Sound Hype Review and feedback/Add onto Denver Sound Hype Events. Can you please explain to me the details of the amounts to pay and how does everything work for me. The Package is $500 which will be paid through Paypal. We start working as soon as we receive it back. I'm very sorry, but your answer is still very short and not clear. Please explain to me what was the point of my song getting selected by you on music x-Ray? I paid $20 and it said that if you like what you hear you will conduct an interview with me and feature my song on your website.nothing about paying an additional $500. This is completely different than what you said. Please find attached what you said on music x-Ray. You talked to somebody else on music x-ray. Im following up about the marketing services we offer. Its a pitch package we have going for artist and producers. Not just anyone gets to work with us, your work has to be reviewed by a member of our team then broken down by A&Rs (Adrian Swish,Mike Downey) to have the opportunity to be promoted further with Sound Hype. I might be interested in your offer but first, can you please direct me to the person who handles the Music X-ray department. I want to find out about the interview and getting my music featured on your website first for which my song got selected for that reason. That's great. When can we start? I can send over the invoice then once its received we get to work! I thought when my track got selected on music x-ray, I was getting an interview and to featured on your website without paying any additional fees. Do I have to pay before you can work with me? Yes..Im sorry thats the vibe you were given. We have a process for the artist we work with. After we decide we will work with an artist, we give you detail then let you make the decision on working with us. Once you decide you're ready to move forward we send you an invoice through Paypal and get to work. I'm sorry but I got the correct vibe from what you posted on music x-Ray but obviously it's a scam! I didn't see anywhere that said pay us $20 and if we like your music we will charge a fee of $500 so we can work with you. This is not acceptable. And you will definitely hear from me on blogs and I will take you to small claims for totally scamming me and getting me excited for nothing! It's not about the money. It's about the principal! You should not lie to people to make money. There are other ways to make your company grow. By doing what you claim to do! I will also have a petition against your company for everyone that got scammed like me to get their money back! Haa! No scam here! Do as you please I explained the process fully! If taking it to the blogs is the route you want to take it will not work in your favor. I would never want to stoop down to that childish act but there will be an exception for this disrespect. I will make sure our interns email every music industry contact,blog,record labels,promoter, and A&R and make sure you get what you put out! Negativity! There are no scams in our services, So if you decline working with us do that for you! Not everybody else. your threatening methods are not going to scare me. I have a mojor label that i'm working with now. so go ahead and tell the world about me and i will do the same about your scam to make money. this is not childish. when you scam someone its not funny. I will proceed to small claims and we will find out who will win! I have a copy of all our conversations over emails and over text. I will blast them all over the internet as well as presenting it to the judge! Good Luck trying to destroy my reputation. TL;DR scam artists feed on the need to succeed, soundhype.com tries to milk you for over $500 to get you some listens and likes online when they claim to be much more! !